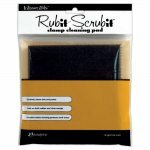 The Rub It Scrub It is rubber stamp cleaning pad. Perfect for cleaning stamps texturizing tools brayers and more! Tough enough to clean deeply etched surfaces gentle on both rubber and polymer stamps non skid cushion backing protects work areas. Simply rinse with soap and water and let air dry. Size: 6x6. See video for how Sue Wilson uses it with her Gilding Flakes!